Modern Brake Lining Set for the 1932-34 Car and pickup. 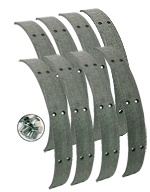 Woven Brake lining set for the 1932-34 Ford V8. Complete with rivets. Set of 8 linings for all four wheels. 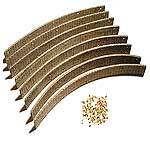 Woven Brake lining set for the 1935-38 American Ford V8 car and pickup. Complete with rivets. Set of 8 linings 13 3/4" long for all four wheels. Front brake grease baffle for the Model A and 1932-36 Ford. Goes inside the backing plate. Bolts that hold backing plate to spindles hold this in place. Catches any grease that spins out of the hub and keeps it off of the brake shoes. Made in USA. Rear brake lever Right side. This is the lever that gets pinned to the rear brake camshaft for your brake rod to hook onto. Rear brake lever Left side. Holds the rear brake levers onto the brake camshaft. Front brake shafts Right 1928-34. The shafts that sets horizontally and operates the A-2075 operating pins. Right Side. Made in USA. Front brake shafts Left 1928-34. Left side. Made in USA. Rides in the brake camshaft and this is what spreads the brake shoes. Made in USA. A well machines US made brake camshaft. Made in USA. Brake floater kit for the 1928-34 Ford front brakes. This kit replaces your original A-2051 wedge studs and allows the brake wedge to float which allows the brake shoes to equalize pressure giving better brakes. One kit does both front wheels. Made in USA. Brake Wedge Stud for the 1928-34 Ford. This is the special bolt that holds the A-2050 in place at the bottom of the front backing plate. Includes A-2052 washer. Made in USA. Brake Wedge stud mount set 1928-34. Two castle nuts and cotter pins for holding the wedge stud in place on the backing plate. One kit does both sides. Made in USA. This is all the parts to replace the rear track assembly. The cam and cam shaft, plus many of the other parts. Does two wheels. Made in USA. 1928-36 Front Shaft Bushing Set. These are the graphite bushing for the front brake shafts on the Model A and 1932-36 Ford. Front brake lever for the 1928-34 Model A and 1932-34 Ford. Fastens to the end of the front brake shaft and your front brake rod attaches to it. Forged. Right and left are the same. This is the pin that holds the lever that your brake rods hook to, on the front end of the shaft. Set of 2. Pin size 1" x 1/4" (excluding head). Made in USA. Brake Dust rings for the 1928-34 Model A and 1932-36 Ford. These little dust rings slip over the shaft of the brake camshafts before the levers are slid on. Keeps dirt and grit out of the bushings. 1 set per car. Made in USA. Brake Camshaft bushing 1928-34. Used on both the emergency brake and the service brake camshafts in the rear housings. The A-2231-A and A-2636-A ride in these bushings. 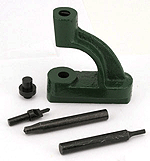 Can also be used on the 1935-37 pickup front brake shaft. These also fits the handbrake lever shaft on the transmision tower, for the early style handbrake lever, that mounts in front of the gearlever. 1928-34 Brake Shoe Roller Pin. Uses one per brake shoe and holds the A-2023 rollers on. Zinc plated and hardened for longlife. Length 1 inch x 7/16" diameter. Brake Wedge Dust cap 1928-36. When replacing the brake adjust wedges, these are the caps that pop out of the backing plate. 1928-36 Brake Adjusting wedge tool. The tool is made special to slip over the square end of the adjusting wedge for adjusting the brake. Powder coated black! Brake Adjustment wedge for the 1928-36 Fords. This is the wedge with the square on the end that sticks through the backing plate so that you can adjust the brakes. Plated and heat treated. Need four. Made in USA. Classic and vintage car brake lining riveting tool. This little anvil clamps in a vice and makes riveting or removing old linings, so much easier. Kit comes with a punch to knock out old rivets, a tool to swedge new tubular rivets, and a tool to drill and countersink linings. Cad plated and heat treated brake shoe roller for the 1928-34 Fords. (16 per vehicle required). These are the clevises that mount on the end of the brake shoe and rest against the brake adjusting wedge. New forged 1928-34 Brake adjusting shaft. These are the clevises that mount on the end of the brake shoe and rest against the brake adjusting wedge. Need 8 per car. This is a new forged version, made to the Ford blueprint. Front backing plate bolt set Full Set 1928-36. The correct old-style bolts with the shank drilled for cotter pins. Full set will do two wheels. Made in USA. No more skinned knuckles with our brake spring pliers. The perfect tool when removing and installing regular style brake shoe springs.